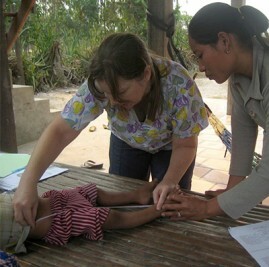 WorldVenture missionary labors to keep Cambodian children who have disabilities in their families. After more than 18 years of working in the United States as a physical therapist, WorldVenture missionary Lisa Yunker decided to share her skills with the vulnerable, disabled children of Cambodia. After joining the organization Children in Families (CIF), Lisa launched ABLE, a program specifically designed to help families work with their disabled children. Lisa and her three employees help families succeed in raising healthy children. In 2014, CIF placed 61 children in families, conducted more than 1,700 family home visits, and provided special emergency care for 13 children. Their goal: to re-integrate 70 percent of Cambodian children back into families, thus limiting both domestic and international adoption. According to see CIF, keeping children in families is not only emotionally and psychologically more stable for children, but also up to five times more cost effective than institutional care, such as orphanages. Lisa is just one advocate making it possible for children—especially those with disabilities—to have a stable childhood. Describe why you decided to move to Cambodia to work with disabled children. There’s a big problem in Cambodia: having many more kids in orphanages than there ought to be. More than 70 percent of the children in Cambodian orphanages actually are not orphans. They have parents; even more than that, they have family members who would be available to care for them. We work with kinship care. So many families live in poverty, and we provide resources and empowerment to keep those children in their networks. In other cases where there are no safe family members, we recruit, train, and monitor foster families. When Children and Families was started, there wasn’t anybody available who had experience with disabilities, so they actually placed children who had disabilities into foster families or were assisting families. But they didn’t have anyone to provide for the special needs those children had. When I found out about what they were doing, it really meshed with what I wanted to do because I’ve long had a passion for working with children with disabilities and their families. I spent more than 18 years as a physical therapist in the United States. A lot of that was doing pediatric work. When the founder of the organization found out what my background was and I found out what they were doing, it just seemed like a really good fit. What does it look like helping disabled children through the ABLE program? My staff and I provide direct services, assess children with disabilities, equipment needs, and anything else they’re needing. We develop a plan with their families, and determine how often we need to make regular visits for those who need it. Here in Cambodia, as well as other places, there’s just not the social services network that we have in the United States. People can’t access them either because of not having transportation, or not having knowledge about what’s available. A couple of little girls who have autism have not been in school at all. We found some special schools that they could go to, and so we’re providing some direct services, but some of what we’ve been able to help with is to get them connected and provide them with transportation to get to the school. What’s rewarding about your day-to-day work? There’s just moments you feel really great about it when you see some of the kids make progress, and you see their families really proud of the progress they’ve made. When they also start to become valued by the community, I feel like that’s just a huge step forward. How has your professional background influenced what you do today? When I worked as a physical therapist, I did a lot of home health and early childhood intervention that was home-based. That gave me really good preparation for this. When you’re working in that setting, it does get to be a little bit of a social work perspective. You are seeing families where they live. Definitely doing it in a new cultural context is a whole other thing. There’s been a steep learning curve, and I’m still on it. What is something challenging about your work? Sometimes there’s a perspective that a child with disabilities isn’t worth helping. It’s hard when you encounter those attitudes from people. The government has actually taken some good steps with legislation, but it’s not really being followed through with. There’s just a long ways in terms of communities in rural places to see a need for change, to see a reason why there should be inclusion of people with disabilities, and why they should have rights. What’s something you wish Americans knew about your work? There needs to be a bigger focus on supporting families and helping communities to become sustaining, rather than pulling kids out of them and putting resources in orphanages. Orphanages get money by having children in them. They can access money from Western sources by advertising what they’re doing for children. They go to impoverished communities and they convince families that they have a better alternative for them. Sometimes they even pay the families to take the kids from them, which is basically trafficking. I’m not saying that every orphanage is corrupt in that way. But there is so much to learn about better ways to help kids and about more sustainable types of development: trying to work toward communities having what they need, rather than it being pocketed in institutions. Along with Lisa, other WorldVenture missionaries work with children with disabilities, including Ruth Sorensen in Uganda.